NOTE TO READERS: For the next several days, our cable ratings charts will be posted first in preliminary form, with the charts in their usual format following a few hours later. Some delays are also likely. UPDATE: Top 40 Originals chart now added. NETWORK UPDATE: The NBA FINALS game adjusted up by 1.7 to a huge 8.9 in final numbers, and the pre-game JIMMY KIMMEL LIVE fell to 1.4. In addition, the WOMENS WORLD CUP match gained 0.1 for a 1.8 final, and AMERICA’S GOT TALENT adjusted up by 0.1. There was also a 0.1 bump for the night’s NCIS rerun. CABLE HIGHLIGHTS: Discovery’s THE DEADLIEST CATCH topped the chart at 0.88, up 0.03 from last week, but lead-out SONS OF WINTER fell 0.14 to 0.37. Although TNT’s RIZZOLI & ISLES was the night’s #2, its 0.75 was down a big 0.26 from last June’s season premiere. Things got worse with the series premiere of PROOF, which at 0.37 was down 0.31 from last June’s PERCEPTION season premiere. It was just as bleak at FX, where TYRANT returned to a 0.30 rating, roughly half of last season’s 0.61 premiere and 0.53 finale. At MTV, the FINDING CARTER season finale was up 0.02 to 0.28 (and steady in the F12-34 demo at 0.60). ABCFamily’s PRETTY LITTLE LIARS was down 0.27 from last week to 0.72 (and down 0.61 in F12-34s to 2.00), although STITCHERS held last week’s 0.36 (down 0.14 in F12-34s to 0.79). CHRISLEY KNOWS BEST (USA) was down about a tenth to 0.57/0.53, and ROYAL PAINS gained 0.02 to 0.37. Bravo’s REAL HOUSEWIVES OF NY slipped 0.03 to 0.51, and SECRETS AND WIVES upticked to 0.20. FLIP OR FLOP (HGTV) lost 0.05 to 0.50. 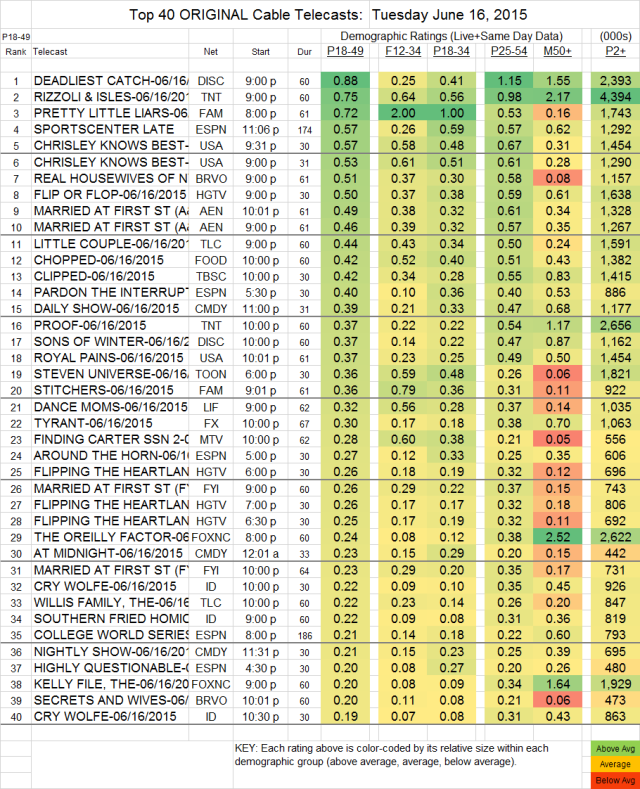 A&E’s MARRIED AT FIRST SIGHT aired 2 episodes at 0.49/0.46, down from 0.52 for last week’s 2-hour episode. On TLC, THE LITTLE COUPLE gained 0.08 to 0.44, and THE WILLIS FAMILY rose 0.02 to 0.22. DANCE MOMS (Lifetime) remained at 0.32.